Thomas Tusser wrote those words in 1157 and they certainly ring true this year. And so it was a rather damp walk through the Churchyard at Bethersden as the month ended. A ginger cat watched suspiciously as Christopher and I wandered through his hunting grounds. Of course we were hoping to find natural treasures and we weren’t disappointed. The yard has burst into a green frenzy of life, plants pushing through the sodden earth in a competition for the light. It’s quite a show and it was difficult to focus on one plant at a time as there was so much to look at. It felt rather like being in a classroom with a sea of hands asking you to choose them to play the lead in the school play. So please excuse the length of my article this month, I didn’t want to disappoint anyone. The first plant to ask to be written about was at the threshold to the Church itself. 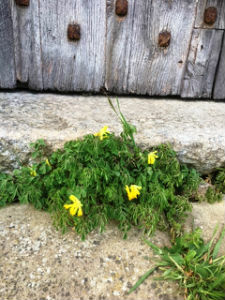 Its yellow flowers and ferny foliage squeezed between the step and the path. 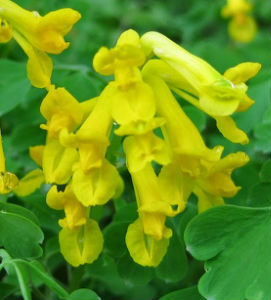 Corydalis Lutea (commonly known as Yellow Fumitory or Fumewort) is a member of the Poppy family and although common in England is native to the Alps, its diverse relatives are found from the high mountains of Africa to the Himalayas to China. It loves the stony Church walls and I found it clinging all around the base of the building, its man-made mountain. Corydalis is from the Greek korydalis meaning Crested Lark, this must allude to the pretty crested flowers. I wondered how the seeds could get into the crevices and after some research found that the plant has a friendly relationship with the ants that share its passion for stonework. The heavy little black seeds of corydalis wear a splash of elaisome, a protein rich, oily substance that ants find irresistible. 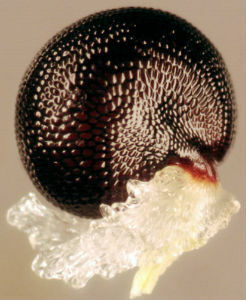 Forager ants carry the seeds back to their nests where the protein is eaten and then the seed ejected. As the ants more often than not live in the cracks of the walls that corydalis favours, they end up exactly where they want to be. Botanists have also found that the sticky coating is off putting to mice and other rodents, so ensuring the seed is there for the ants. This kind of mutually beneficial relationship is called Myrmecochory and is very common; Violets, Trillium, Primroses and many others are distributed by their ant gardener friends. The Chinese have used this little plant for centuries as a major pain reliever, not a surprise for a member of the Poppy family. It is also the source of the alkaloid Bulbocapnine which has been used in conventional medicine to treat convulsions, Parkinson’s disease and Meniere’s disease. where you will find photographs and video clips. 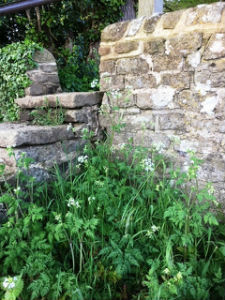 We had entered the yard via the beautiful old stone steps at the South Western end, the Cow Parsleys delicate foamy flowers hovering either side of the Bethersden Marble Wall. It was good to see that they hadn’t succumbed to the council strimmers and along with Jack in the Hedge, Nettle and Herb Robert they made a fine natural entrance border. Anthriscus sylvestrus is also known as Queen Anne's Lace, Fairy Lace, Kex and Mother Die, that last name a warning to discourage the picking of umbellifers, many of them can be confused with spotty stemmed and poisonous Hemlock. Many people are superstitious about bringing cow parsley into the home but I’ve noticed that many flower arrangers use it now; St. Mary’s has some in the altar arrangement and it looks so pretty in the light. Used widely in Chinese medicine as a tonic for the liver and blood, it has been rather ignored in conventional medicine until fairly recently. Researchers in Italy found it to contain high levels of a deoxypodophyllotoxin (what a mouthful!) that has been shown to inhibit cancer cell growth. Sometimes it feels that the natural world has all the answers if only we would look and listen enough. Cow Parsley is important for our many pollinators, a much-needed source of food early on in the foraging year and is often full of shiny little beetles who appear as if from nowhere if the flower is brought indoors. ‘The mind of the hive thinks this is the end of everything. 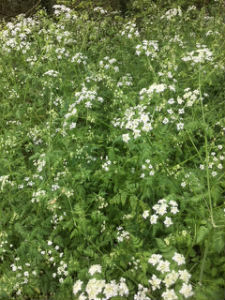 It seems to me that God has created a lot of Cow Parsley, so much so that it should be noticed, loved and admired. Like so much of the creator's work it goes by the wayside, quite literally in this case. Whenever I visit somewhere new I like to explore the hidden and forgotten spaces; I nearly always find something magical and Bethersden was not going to disappoint me. The compost heap was a treasure chest of wonders. 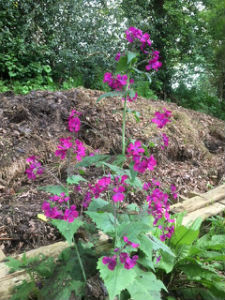 Among the Bluebells, Primroses, Nettles, Ivy, Stitchwort and Toadflax (they insisted I mention them) we found this bright purple flowered delight. Honesty is the most appropriately named plant, both common and Latin name come from its distinctive seed cases. Honesty because of the transparency that hides nothing and Lunaria Annua because they are shaped like the moon. In Kent it is sometimes known as ‘Devils Ha’pence’, this may come from the idea that they are the coins of Judas, taken in betrayal of Christ. We continued our walk, admiring the many lovely flowers, the moving memorials and the trees springing into glorious leaf. We were watched by the Blackbirds who were nesting in one of the smaller trees. A battle broke out between two males, no doubt a boundary dispute. Blackbirds (Turdus Merula) are brave little birds, they will confront a cat or fox near their nest and tell it off in no uncertain terms. There is something quintessentially British about the Blackbird, it's our most successful garden bird and is adaptable to town, city or countryside. They like to sing after rain, and their clear voice sounds all the more sweet when backed by a chorus of raindrops dripping from freshly baptised leaves. Right now as I write this I can hear them in our garden at their evensong. We are lucky enough to have a Blackbird again nesting in our neighbour's Wisteria; in folklore it's seen as good fortune to have one nesting near your home. It’s also wonderful to see the parents bringing food for the chicks and of course telling Puddle the dog off when he dares to wander into his own garden! The nest will have been made by the female, she sits on her turquoise, brown spotted eggs without respite from the male but he helps feed the chicks. He can be very amusing to watch, after rain he can be seen hopping about on the lawn, head on one side listening for worms. I finish writing this two days after Ascension and so I would like to leave you with this extract from a poem by David Herbert Lawrence called ‘Longing for Spring’. It seems so fitting after the sadness and horror of the crucifixion that Ascension happens for us in England when the earth herself rises from the dead towards heaven in a show of verdant, joyous life. Spring Blessings on us all. References, websites and other sources of information. Please don’t take chances with your health; any references made in my articles to medicinal, health or wild food value of plants are made as a point of interest not as medical or health advice. Always seek the advice of a Doctor if you are unwell or wish to use alternative remedies and thereafter of a qualified herbalist if you wish to use plants or flowers. If you wish to forage for wild plants it's best to seek the advice and training of a wild forager, there are many suitable teachers that can be found via the internet. Nature demands respect.